A surefire way of embarrassing yourself is by saying anything optimistic-sounding about the Charlotte Hornets based on something they do in the first month of an NBA season. They finished each of the last two seasons with 36 wins, and their biggest roster upgrade headed into this season involved jettisoning Dwight Howard and hoping that Cody Zeller can stay healthy for 82 games. That’s not nothing, but the safe money would still be on them winning somewhere between 33 and 43 games. It seems their role in the universe is to personify the concept of the treadmill of mediocrity. Through three games, it’s working. The Hornets are a wide-open corner three bricked by the corpse of Nic Batum away from being 3–0 today, with wins over pretty good Bucks and Heat squads. Of course, Kemba is scoring 35 points a game on almost 35 percent usage, but whatever. Whole years of the Hornets getting most of everything wrong when it comes to roster construction have brought them to this point, where the best play they can run on any given trip up the floor is the Just Do Something Awesome, Kemba. It’s sort of nightmarish to think of all that the Hornets need to go right this season in order to return to their 48-win form of the 2015-16 season. They need Batum to remember how to score; they need Jeremy Lamb and Malik Monk to be more than streaky all-offense goofs; they need Marvin Williams to hold off what has been a pretty alarming assault by Father Time for one more season; and they need Michael Kidd-Gilchrist to do something, ANYTHING on offense. They need Zeller to hold up. They need to drag rotation minutes out of some combination of Frank Kaminsky, Bismack Biyombo, and Willy Hernangomez. And they need to survive at least 10 or 12 minutes a game when Tony Parker is running the show while Kemba catches his breath. It’s a lot to hope for. Probably too much. 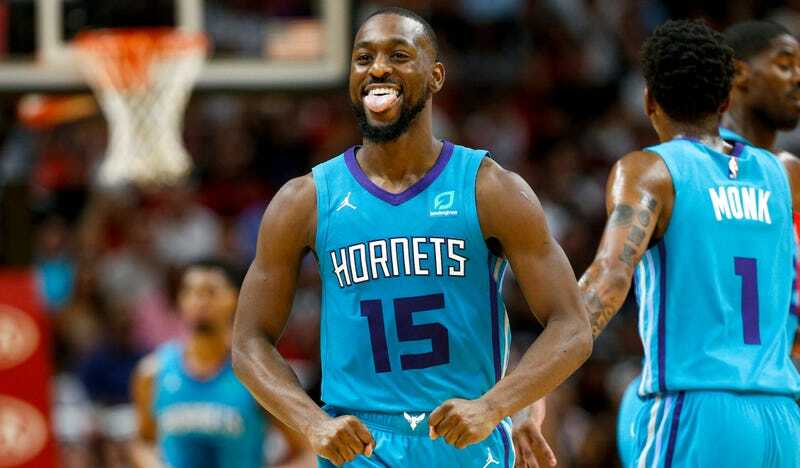 That’s not to say it can’t happen, only that we’ve reached the point in this era of Hornets basketball when it’s best not to expect Kemba’s heroics to serve any greater basketball purpose in Charlotte. Until the Hornets prove otherwise over most of a season, or until Kemba is traded to, say, the Lakers, the reason to watch Charlotte is to watch Kemba cook. Good thing it’s still an incredible show.